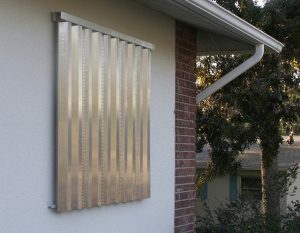 Aluminum shutters help protect windows from flying debris during windstorms. Here in the latter half of June, temperatures have heated up and summer thunderstorms have swept through on a regular basis. As we are reminded often, hurricane season has begun. While we haven’t had a major storm in 11 years, northwest Florida is still a prime target. 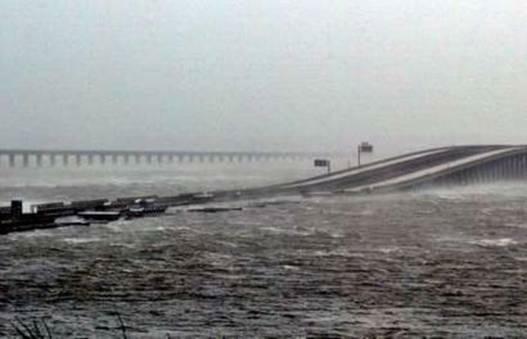 Be Ready Florida is a statewide program dedicated to helping citizens and visitors to the state prepare their homes, businesses, and families for the onslaught of a major windstorm. In order to teach individuals how to best prepare, three free, two-hour online BRACE for the Storm workshops are scheduled for June 29. The workshops will be held from 10 am-noon, 2-4 pm, and 7-9 pm. Registration is online here. According to their website, “During each workshop participants will gain valuable insight on how homeowners can undertake one or more windstorm mitigation projects on their homes to strengthen it against Florida’s next wind disaster. The importance of mitigating homes against the damage caused by a flood or wildfire will also introduced.” The workshops also discuss how mitigation techniques can save money on homeowner’s insurance. Be Ready Florida also offers an online directory of contractors, suppliers, funding sources and inspectors that homeowners can access to find help with home projects. In Escambia and Santa Rosa County, homeowners can also contact Rebuild Northwest Florida, a nonprofit organization that uses FEMA funds to offset the cost of home wind mitigation. 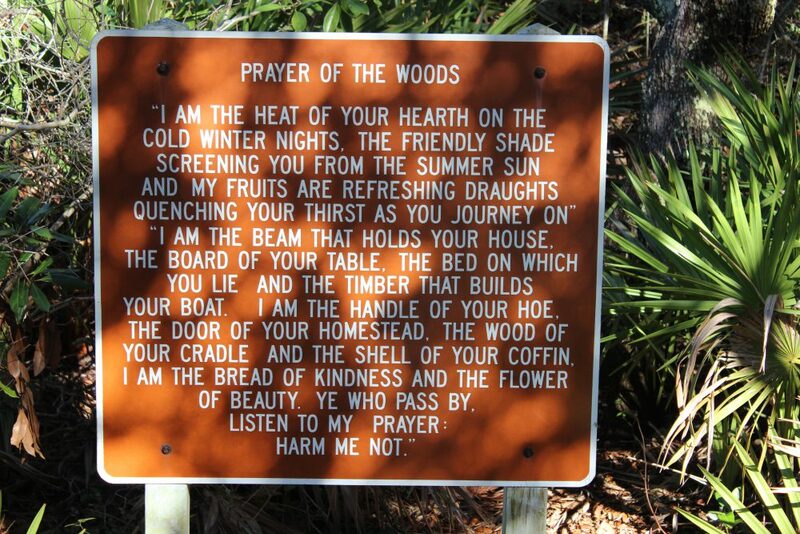 The “Prayer of the Woods” is an attitude that many in this part of the panhandle try to live. 30A in south Walton County is a special place. 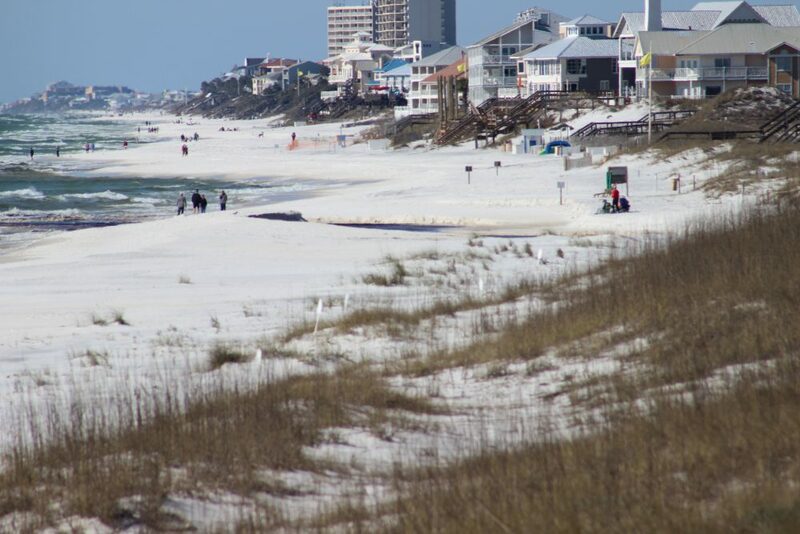 Undiscovered for years, then developed… but developed more sustainably than most coastal panhandle communities – this area has now become a go-to destination for many in the southeastern U.S. Grayton Beach, Seaside, Water Color, and others were developed with idea of walkable-biking community and allowing as much nature to remain as possible. Many subdivisions use native plants for their landscaping. It is a neat area to explore. 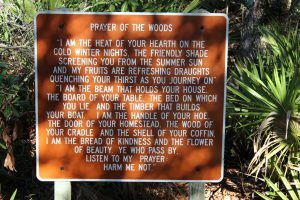 My base camp for this part of our ICW tour was Topsail State Park. 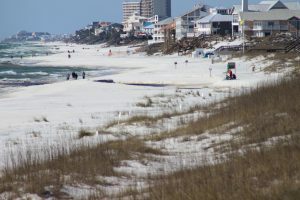 Though there are numerous other locations to camp, they were all full… the 30A Song Writers Festival was going on at the time. The first thing I noticed was a bike trail that extends much of 30A itself. There were locations along the way where visitors can rent bicycles and it is a great way to take in the scenery… and there is scenery. 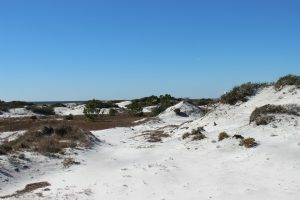 Some of the more majestic dunes I have seen anywhere along the panhandle are found here. Dunes in Pensacola use to look like these but storms have taken their toll – somehow the dunes of 30A were spared. 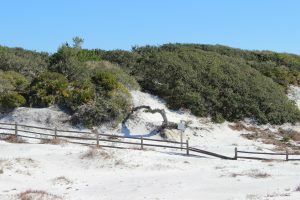 The spectacular dunes of south Walton County. The wind sculpted plants of the tertiary dunes. 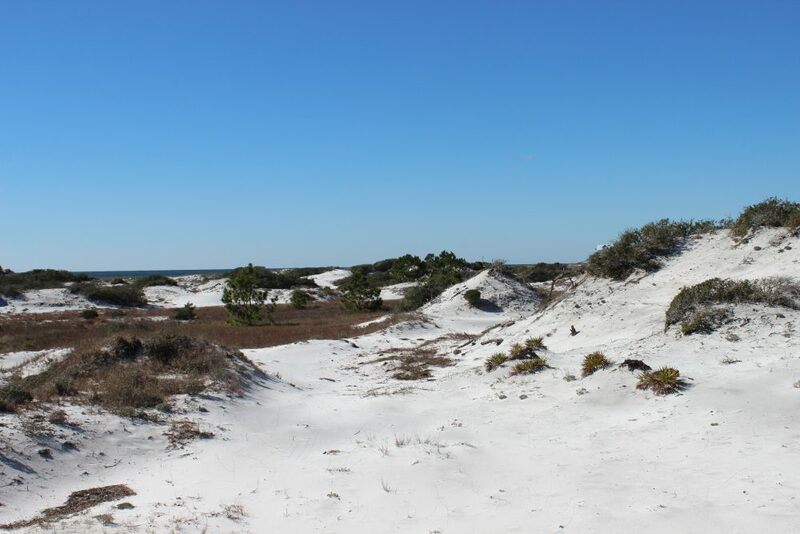 You cannot talk about the dunes without talking about the dune lakes. Scattered across much of the panhandle the highest concentration, and least impacted, of these lakes are found here in Walton County. These freshwater lakes are separated from the high saline Gulf of Mexico by a field of dunes. There are channels that connect them but these are sometimes closed by moving sand. 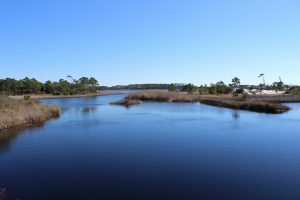 When open, these channels allow the brown tannic waters of the lakes to spill into the Gulf – a weird sight which trigger thoughts of pollution. 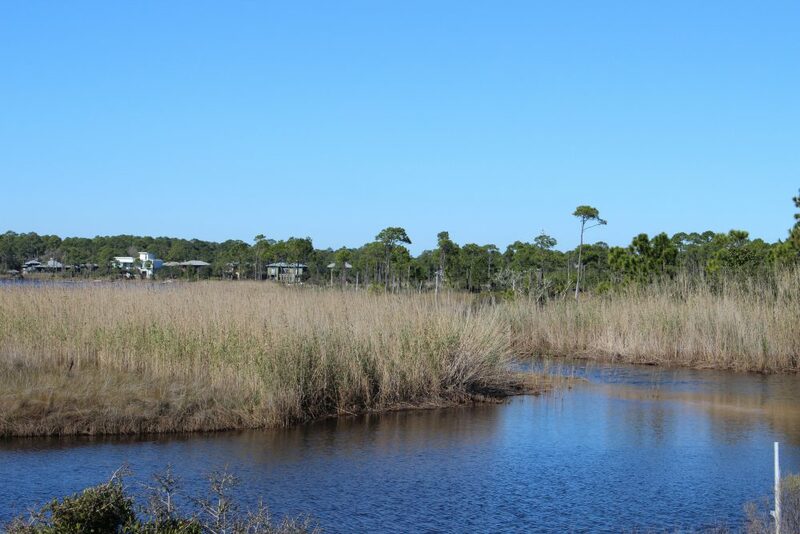 You can see evidence of high tides entering the lakes with the presence of cordgrass and needlerush (classic salt marsh plants) and species of marine fish such as stingray and redfish. There is access to some of the dune lakes via the state parks. 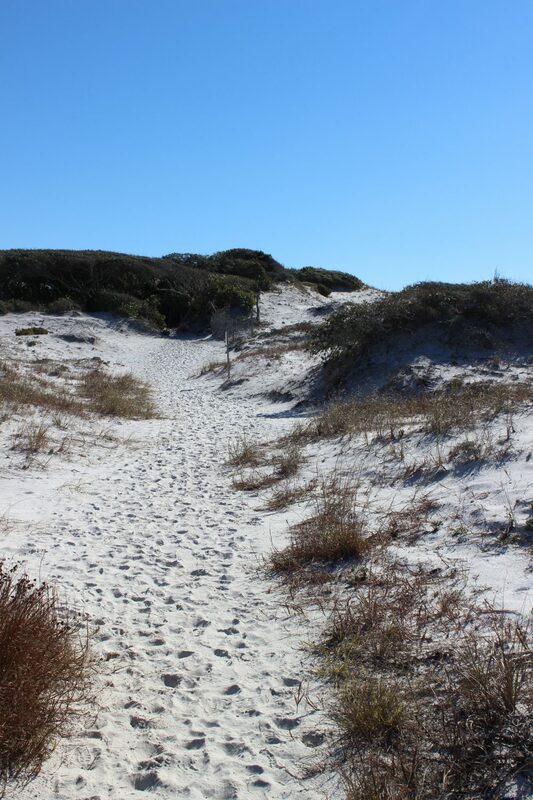 Here there are trails along the shore and through the dunes, and kayaks to rent. 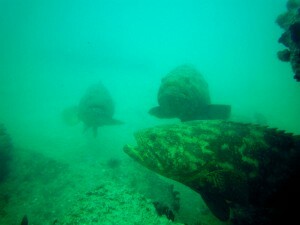 The gulf is not but a few feet away – this is a great place to bring snorkel gear or binoculars for birding. 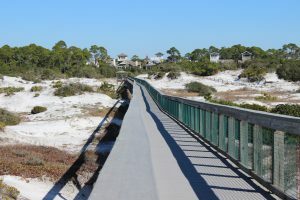 One of the many “jewels of south Walton” – the dune lakes. 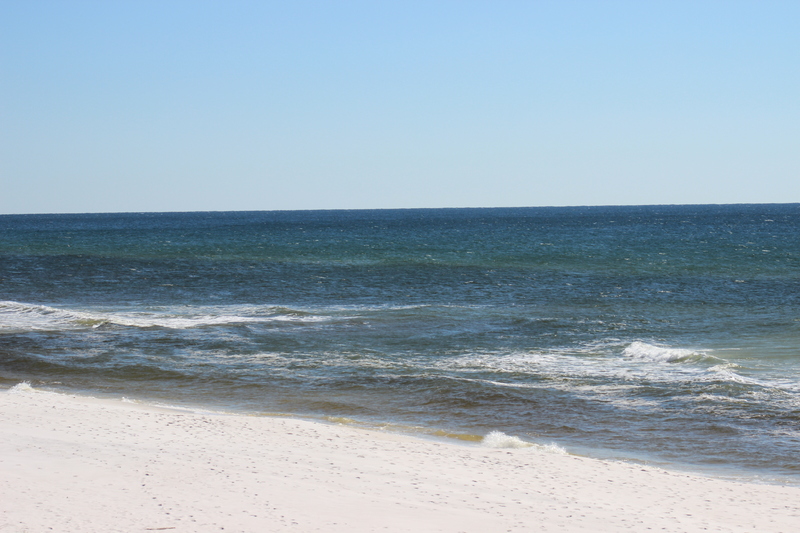 In the distance you can see the brown-tannic water of a dune lake entering the Gulf of Mexico. Black Needlerush is one of the species of marsh grasses that live in brackish conditions. 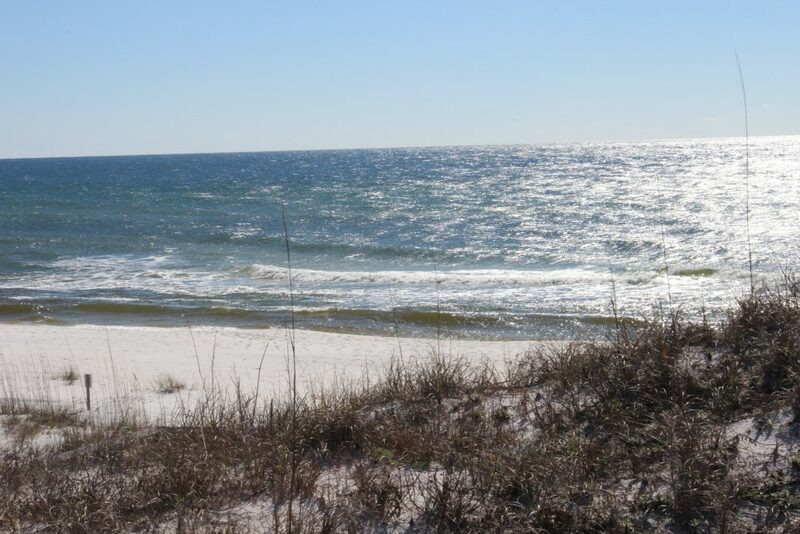 The Gulf of Mexico in south Walton County. Another view of the Gulf of Mexico. The boardwalk of Deer Lake State Park off of Highway 30-A. you can see the tracks of several types of mammals who pass under at night. There are additional state park and state forest trail heads along 30A to explore. Accommodations are hard to come by during peak season so you will have to plan ahead – but a few days here is worth it. If visiting the Escambia / Santa Rosa area be sure to check out the Naturally EscaRosa website and download the app to find great outdoor adventures in the western panhandle. 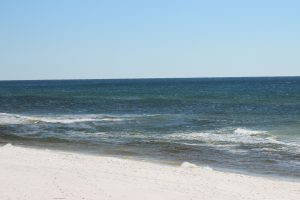 I have played in the waters of the northern Gulf of Mexico all of my life… but I have never heard of this – “sea lice.” It has been in the news recently and I have had a couple inquiries concerning it so I decided to investigate. 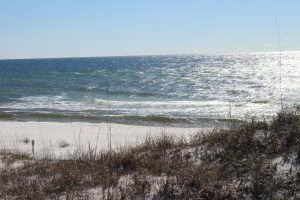 A few weeks ago there was a report of “sea lice” in Walton County. Bathers were leaving the water with a terrible skin condition that was itchy and painful, particularly in areas beneath their bathing suits. Photos of this show a series of welts over the area – almost like a rash. What was causing it? And what can you do about it? 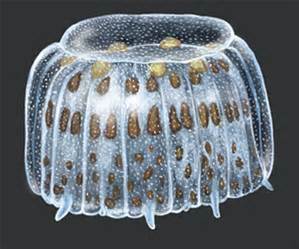 Illustration of the “thimble jellyfish”. My first stop was Dr. Chris Pomory, an invertebrate zoologist at the University of West Florida. Dr. Pomory indicated that the culprit was most probably the larva of a small medusa jellyfish called the thimble jellyfish (Linuche unguiculata), though he included that it could be caused by the larva any of the smaller medusa. Dr. Maia McGuire, Florida Sea Grant, told me a colleague of hers was working on this issue when she was in grad school at the University of Miami. Published in 1994, it too pointed the finger at the larva of the thimble jellyfish. Here I found the term “Sea Bathers Eruption” (SBE) associated with occurrences of this. I also found another report of SBE from Brazil in 2012 – once again pointing the finger at the thimble jellyfish larva. So there you go… the most probable cause is the larva of the thimble jellyfish. Note here though… Dr. McGuire indicated that SBE was something that was problematic in south Florida and the Caribbean… reports from the northern Gulf are not common. So what is this “thimble jellyfish”? Most know what a jellyfish is but many may not know there are two body forms (polyp and medusa) and may not know about their life cycles. The classic jellyfish is what we call a medusa. These typically have a bell shaped body and, undulating this bell, swim through the water dragging their nematocyst-loaded tentacles searching for food. Nematocysts are small cells that contain an extendable dart with a drop of venom – this is what causes the sting. Nematocysts are released by a triggering mechanism which is stimulated either by pressure (touch) or particular chemicals in the water column – hence the jellyfish cannot actually fire it themselves. The thimble jellyfish are dioecious, meaning there are male and females, and the fertilized eggs of the mating pair are released into the ocean. These young develop into a larva called planula, and these seem to be the source of the problem. Drifting in the water column they become entrapped between your skin and your bathing suit where the pressure of the suit against the skin, especially after leaving the water, causes the nematocyst to fire and wham – you are stung… multiple times. The planula larva are more common near the surface so swimmers and snorkelers seem to have more problems with them. So what can be done if you encounter them? Well – there are two schools of thought on this. (1), go ahead and stimulate the release of all nematocysts on your body and get it over with or (2) do everything you can to keep any more nematocysts from “firing”. Some prefer #1 – they will use sand and rub over the area where the jellyfish larva are. This will trigger the release of any unfired nematocyst, you will deal with the pain, and it will be over. However, you should be aware that many humans have a strong reaction to jellyfish stings and that firing more nematocysts may not be in your best interest. Some will want to take a freshwater shower to rinse them off. This too will trigger any unfired nematocysts and you will be stung yet again. Using vinegar will have the same response as freshwater. So what do you if you DO NOT to get stung more? Well… the correct answer is to get the bathing suit off and rinse in seawater that DOES NOT contain the larva… easier said than done – but is the best bet. Is there any relief for the pain and itch? Once sea bather’s eruption occurs (and you have taken off your swimsuit and showered), an application of diluted vinegar or rubbing alcohol may neutralize any toxin left on the skin. An ice pack may help to relieve any pain. The most useful treatment is 1% hydrocortisone lotion applied 2-3 times a day for 1-2 weeks. Topical calamine lotion with 1% menthol may also be soothing. Nonsteroidal anti-inflammatory drugs such as ibuprofen and aspirin (but not in children) may also help to reduce pain and inflammation. If the reaction is severe, the injured person may suffer from headache, fever, chills, weakness, vomiting, itchy eyes and burning on urination, and should be treated with oral prednisone (steroids). The stinging cells may remain in the bathing suit even after it dries, so once a person has developed sea bather’s eruption, the clothing should undergo machine washing or be thoroughly rinsed in alcohol or vinegar, then be washed by hand with soap and water. Antihistamines may also be of some benefit. Other treatments that have been suggested include remedies made with sodium bicarbonate, sugar, urine, olive oil, and meat tenderizer although some of these some may increase the release of toxin and aggravate the rash. Symptoms of malaise, tummy upsets and fever should be treated in the normal fashion. This is a “new kid on the block” for those of us in the northern Gulf. 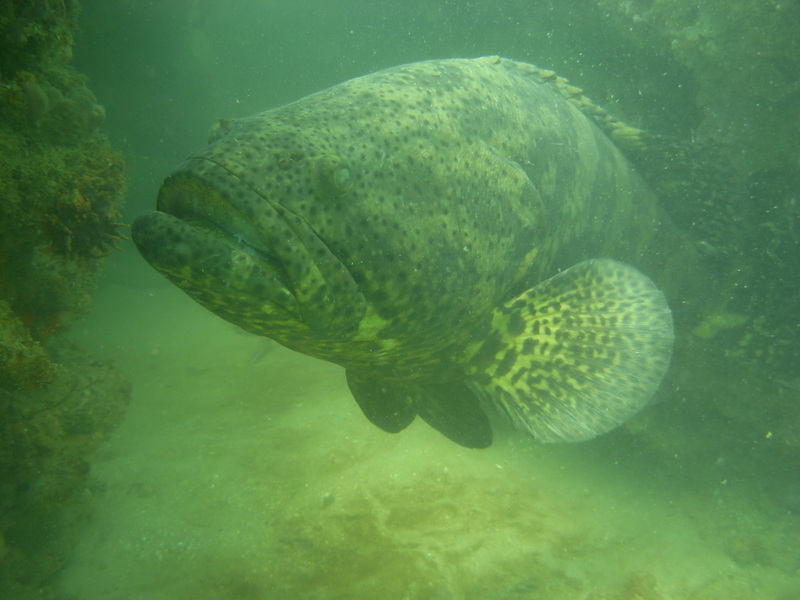 It has been in south Florida and the Caribbean for a few decades. As the Gulf warms, more outbreaks may occur, there is really not much to be done about that. Hopefully most reactions will be minor, as with any other jellyfish sting. For more information visit the Florida Department of Health. 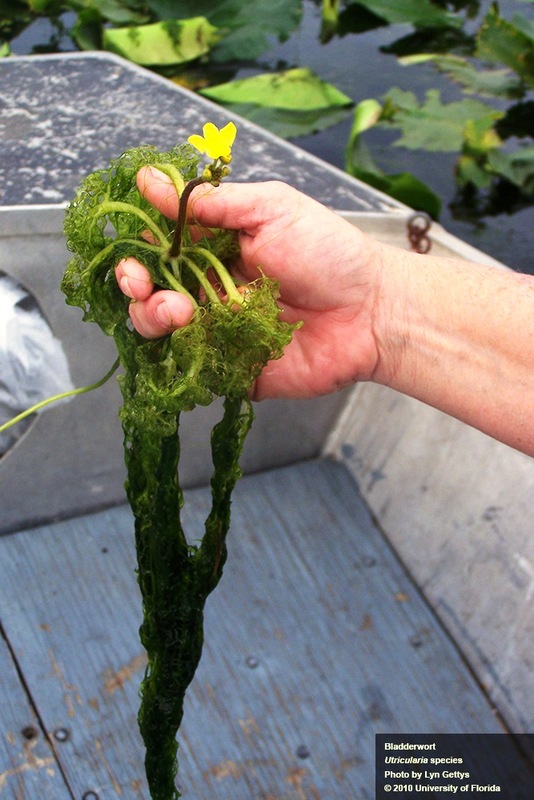 Florida’s Aquatic Carnivorous Plants – Yes, Aquatic! These bladderworts are in the genus Utricularia whose Latin meaning, “little bag,” is descriptive of the many small bladders (only a few millimeters in size) on the plant which actually trap and digest tiny aquatic invertebrates! 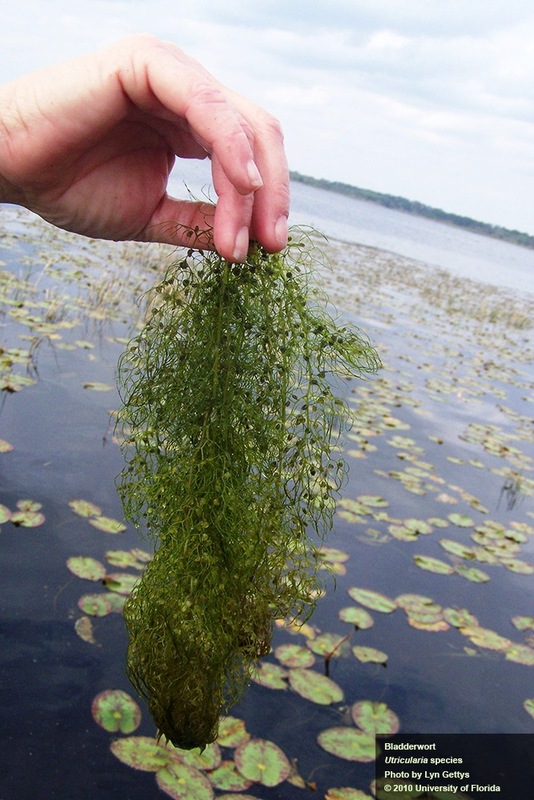 Bladderworts are found in lakes, ponds, wetlands, and quiet coves of rivers and streams. They are commonly found in waters with low pH and low nutrients. One interesting fact is that bladderworts do not have roots. They have main stems from which lacy, intricate leaves grow. Like other plants, bladderworts produce food by photosynthesis; but the trapped invertebrates supplement the nutritional requirements of this plant. The Botanical Society of America reports that currently 220 species of Utricularia are found in temperate and tropical habitats throughout the world representing the most diverse and widespread genus of carnivorous plants. Similar to a Venus fly trap, hairs on the opening of the bladder act as triggers. When tiny prey swim by and contact these hairs, it causes the bladder to spring open and inflate, drawing in water and prey like a vacuum. Research has found that bacteria living in the traps act together in a mutualistic role to digest the food trapped in the bladders. 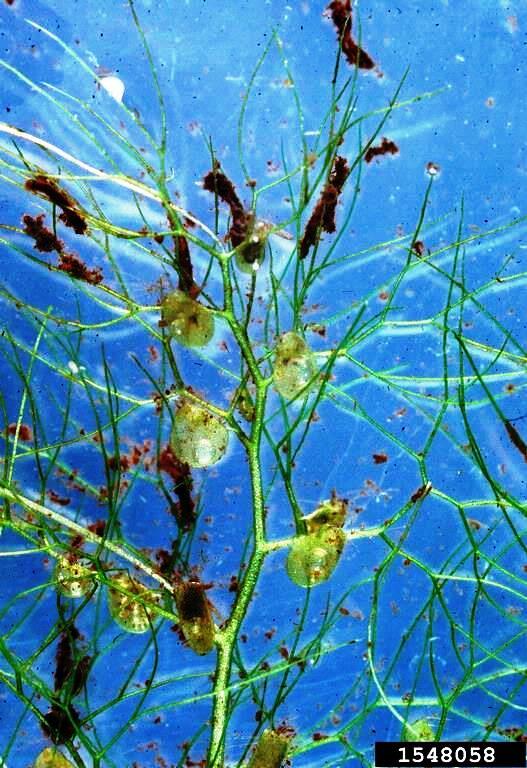 An article in the Journal of Experimental Botany entitled “The carnivorous bladderwort (Utricularia, Lentibulariaceae): a system inflates,” details another fascinating aspect of these plants: the bladders often look like the tiny prey (microcrustaceans/cladocerans) they are catching. Bladderwort flowers are another beautiful feature of this plant. In Florida most species have yellow flowers, some are lavender to purple. The flowers bloom several inches above the water, and their shape is designed to efficiently attract and remove pollen from pollinating insects like bees. Part of the flower is shaped like a spur which contains a nectar reward for pollinating insects. 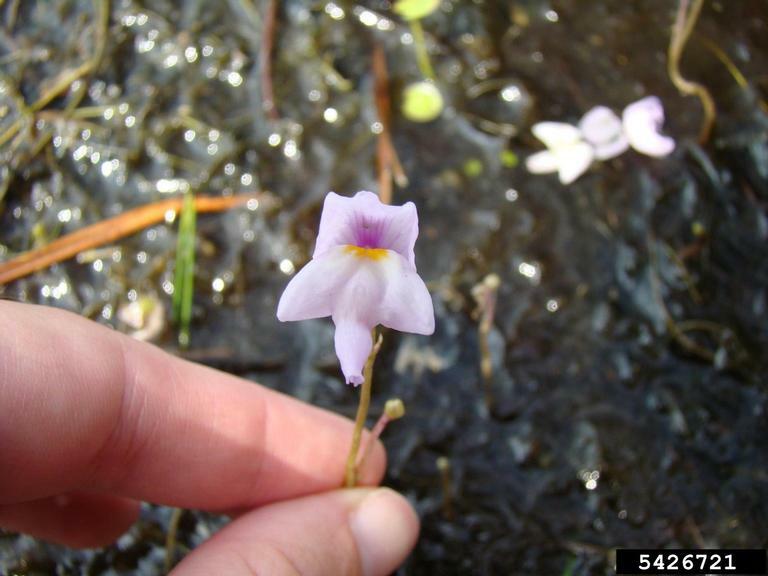 This link, The Utricularia, to a Botanical Society of America publication details the botany and pollination ecology of bladderworts. We hope this article piques your curiosity about some of Florida’s obscure native, aquatic, carnivorous plants! Maybe you, too, will include them in your list of favorite La Florida plants! Northwest Florida–Where the Plants Eat Meat!